Martin Luther King Day is this Monday, and in the same vein as last year’s post on Dr. King in animation, I thought I’d look at some of the depictions of Martin Luther King in comics. While the blog “Joe Sergi’s Cup of Geek” has done a much more thorough summary of Dr. King’s appearances (see here and here), I thought I’d note some of my own comic impressions, anyway. 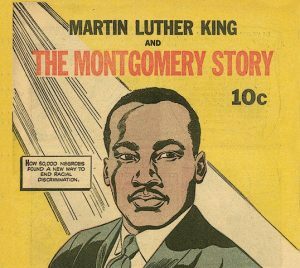 The highest-profile and most famous depiction of Dr. King in comics must be the one-shot comic “The Montgomery Story.” Produced by unknown writers and artists and published by the organization Fellowship of Reconciliation in the late 1950s, the comic was distributed across the south as a way to teach others the virtues and tactics of nonviolent civil protest. The comic also included an overview of the life story (to date) of Dr. King. The comic’s been credited by some for helping play a role in the civil rights movement, and has even been distributed (translated into Arabic and Farsi) in the Middle East during last year’s Egyptian uprising. (MSNBC even mentioned the comic’s distribution there.) It was also distributed through Latin America after being translated into Spanish. While few copies remain, the entire comic can be read online here. I think it’s a strong example of the influence that comics can have as a medium. Being available electronically and translated by others into other languages (and finding new life in the “Arab Spring” uprisings after being mostly forgotten for 50 years) also speaks to the importance of the public domain, versus potentially repressive copyright laws. Though the comic presumably is still copyrighted by Fellowship of Reconciliation as a “corporate work,” or a nonprofit one in this case, the FOR is quite supportive of the translation efforts, and even offers electronic PDFs of the comic for sale on their site. The earliest known DC appearance is apparently in a flashback in the now-famous “Green Lantern” (vol. 2) #76 from 1970, the first of the Green Lantern-Green Arrow team-ups. While lecturing Hal on the state of the world, Ollie references Martin Luther King’s and Robert F. Kennedy’s then-recent deaths. The Superman titles occasionally referenced Dr. King as well, including “Superman” #400 in 1984, as well as several 90s Superman titles. Of course, Earth-1’s Superman would’ve been alive during the civil rights movement, either as an adult or as a teenage Superboy, depending on comic book time. While they never published a story about Clark meeting Dr. King (which I would’ve loved to have seen), there were a few late 1960s/early 1970s stories about discrimination. Said stories had good intentions, but came off as heavy-handed. While not focused on Dr. King, a 90s Superman story did show how Perry White, the “Daily Planet”‘s editor, took part in the civil rights movement in the 60s. 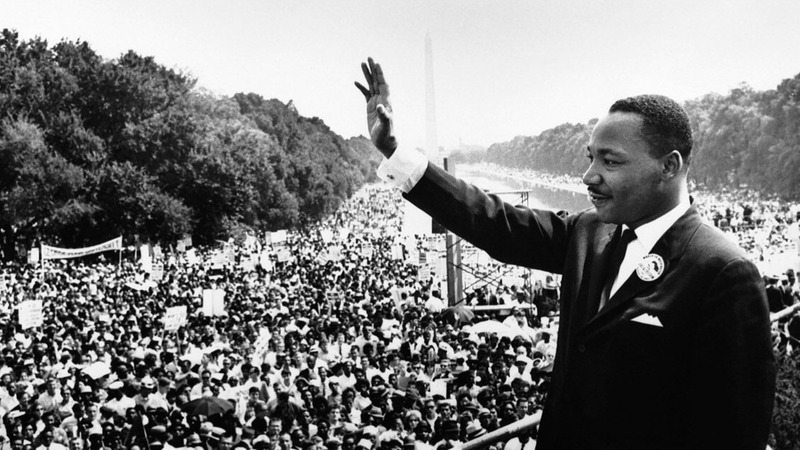 Marvel’s referenced Dr. King in some stories as well, including in several Captain America stories. Nowadays, comic book time prevents Cap from having been around during the civil rights movement. At this point, he would’ve been thawed sometime just after the turn of the millennium at the earliest.